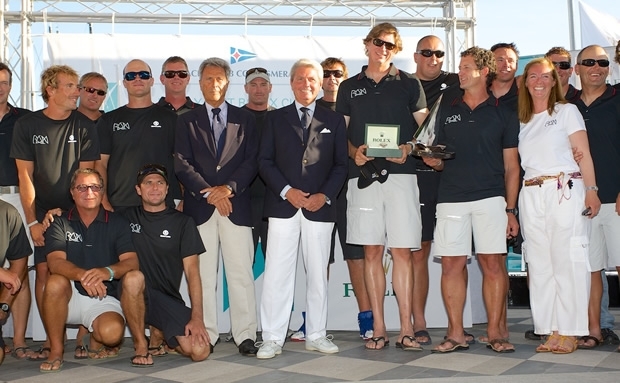 The 2013 Maxi Yacht Rolex Cup concluded today in Porto Cervo, Sardinia. A dramatic final day ensued with three yachts making impressive recoveries to seal championship titles. Two windward-leeward races concluded the Mini Maxi Rolex World Championship with a coastal race through the Maddalena archipelago organized for the remaining classes. Today’s winners were: Rán 2 (GBR) in the Mini Maxi Rolex World Championship with a bullet and a second; Velsheda (GBR) in J-Class; Morning Glory (GER) in Maxi Racing; Nefertiti (GBR) in Maxi Racing/Cruising; Nilaya (GBR) in Supermaxi; and Open Season (GBR) in Wally. 2013 Maxi Yacht Rolex Cup winners are: Rán 2 in the Mini Maxi Rolex World Championship; Velsheda in J-Class; Aegir (GBR) in Maxi; Altair in Maxi Racing/Cruising; Nilaya in Supermaxi and J-One (GBR) in Wally. Victory in yesterday’s coastal race left Rán 2 two points behind Andres Soriano’s fellow 72ft Alegre going into the final day. “We decided to sail the way we usually do: confident, fast, concentrated and quietly,” explained Zennström, whose crew mounted a similarly successful recovery in 2010. “In today’s first race we had a good start, rounding the top mark ahead of everyone. We had a first and they finished fifth which took us two points ahead for the last race.” That left Rán 2 firmly in the driving seat, and Alegre faced with reversing the result of the first race. “It was a tough day. Everyone lifted their game,” explained Alegre tactician, Chris Main. “Today it came down to the starts. Rán had a really good start in winning the first race. In the second race we had a good start and a good race.” Alegre performed gallantly in winning race two before waiting to see how things played out behind. “It was exciting coming into the finish. We were holding our breath,” admitted Main. However, in the final 100 metres, Rán 2, enjoying a fast downwind leg, decisively overtook Hap Fauth’s defending champion Bella Mente from the United States to claim second place and seal the title. A euphoric Zennström has even more reason to treasure this third Mini Maxi Rolex World title. “This is the last regatta for this boat (a new Mini Maxi Rán will launch next year). It is a special win and amazing to end on a high note. Rán must be the most successful Maxi in many, many years.” George Sakellaris’ Shockwave completed the championship podium finishing third. Rán 2 was not the only yacht to mount an impressive comeback. Brian Benjamin’s 82ft Aegir 2 was seemingly out of the running halfway through the Maxi Racing competition having not started the first race before finishing a disappointing third on day two. However, three straight bullets elevated Aegir to the top of the standings ahead of two very contrasting and successful boats - Lord Irvine Laidlaw’s 82ft Highland Fling and Hasso Plattner’s 87ft Morning Glory – both former winners. “We didn’t expect to do so well against the other two boats but the races have come down to seconds. Below ten knots and we are in with a shout,” explained Aegir trimmer Pete Cummings before today’s racing. Aegir performed strongly in the light conditions that prevailed this week. “We’ve done the impossible. It feels good, unexpected,” said Benjamin. “It wasn’t very windy this week which helps us as the other two boats were unable to plane.” Aegir adds the Maxi Racing title to last year’s Maxi Racing/Cruising crown - a title this year won this year by Altair by Robertissima. Filip Balcaen’s 112ft Nilaya had already sealed a third straight Supermaxi title yesterday. The final prizegiving was held this evening on Piazza Azzurra at the Yacht Club Costa Smeralda. Trophies and Rolex timepieces were awarded to the six class winners and to Lupa of London as the best Mini Maxi Racer/Cruiser. The inaugural Commodore Alberini Perpetual Trophy, established to commemorate Past YCCS Commodore Gianfranco Alberini who ‘sailed away in June’, was awarded to Gerard Logel’s @robas.